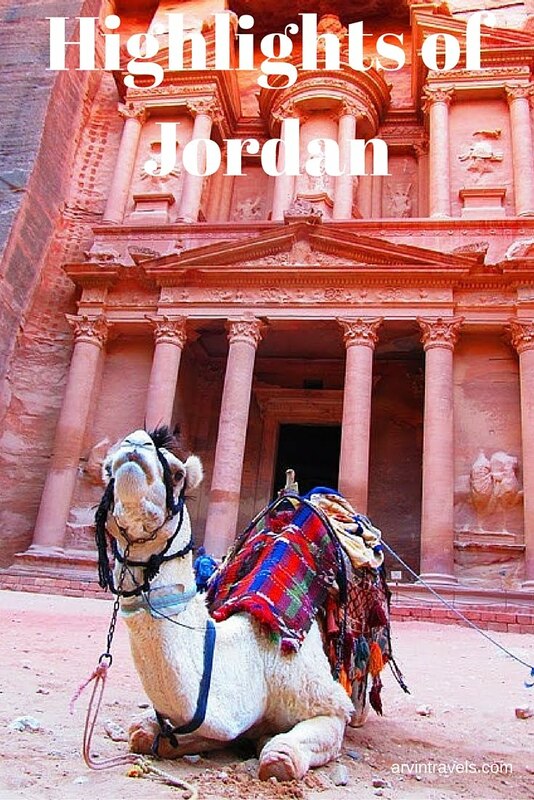 One of the most beautiful countries in the Middle East, Jordan has a lot of attractions for visitors. There is ancient history here as well as spectacular desert formations and sea life. Here are some of the top things to see and do on a holiday in Jordan. I didn't spend much time in Amman, One can find a decent room for about 30 US Dollars just about anywhere in Jordan, I paid a little extra for a nicer room with hot showers, most places include breakfast. Cabs are cheap and the best way to travel in Amman, if you know Arabic you could try buses. Amman Airport to Hotel Transportation: I had my hotel arrange Airport pick up, Cab driver was standing with my name on a paper, easy and convenient. Beautiful City, head to the Tourist information office, you will get all the information and maps you need about Aqaba there. Just off the coast of Aqaba you can go snorkeling and diving in the Red Sea. You’ll see coral reefs and a whole range of colorful fish. From clown fish to other sea wonders you’ll be amazed at the variety of sea life here. And don’t forget to head back into Aqaba for a delicious meal at one of the many fish restaurants. For a different kind of water experience head to the Dead Sea for a float. The highlight of my trip was a dive in the Red Sea. There are several Dive centers in the city, paid 35 JD for equipment and 40 minutes of diving. If you ever saw Lawrence of Arabia and were mesmerized by the desert rock formations then Wadi Rum will enthrall you. This is the setting for that movie and is breath-taking. Ride a camel across the desert and camp out under the stars here for a magical experience. Below is the Mini Bus I took from Aqaba to Wadi Rum For 5 JD, a picture of inside of what the van looks like. It drops you off at the Highway and from there another Van or mini Bus to Wadi Rum Tourist Center. Once at the Tourist office you pay the entrance fee, there will be some locals offering you camp site and tours. Bargain the prices, most camp site include dinner and breakfast, which is quiet good. I took a Jeep Tour of Wadi Rum and by sunset ended up climbing a hill to get some great views and Pictures. The camp tents are comfortable and at night there was a bonfire with a few tourists sharing stories of their travels, there were 8 of us, mostly french, some there for mountain climbing. At night there is a clear sky and its the most stars in the sky that I have ever seen. Most people living in and around Wadi Rum are Bedouin, They are descended from nomads who live around Arabian and Syrian Deserts. For most people Petra is a highlight of any visit to Jordan. 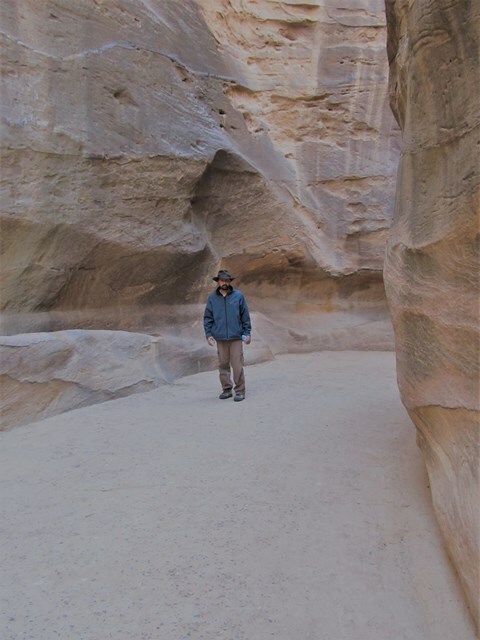 The walk down the Siq is full of mystery and that first glimpse of the Treasury is unforgettable. But do take time to see the rest of Petra as there is a lot more to discover in this ancient city. From the Street of Facades to the High altars you’ll be amazed at the beauty of Petra. One of the Wonders of the world, costs 50 JD about 75 USD for entrance. Leaving Petra on a Friday for Amman, our Bus that was supposed to leave at 7 AM did not leave till 1 PM. The mini buses generally will not leave in Jordan till they are full, so we ended up paying the bus driver twice the fair to drive (we as in the few of us in the bus). Jordan is full of amazing experiences and is very diverse. From the cosmopolitan life of Amman to the solitude of the desert, its amazing! 10 years has been a long time. Have you been back to Jordan since then? I have a bookmark from Jordan. A friend brought it back after her business trip there in 2008. A lot has changed. None the less, it's still a beautiful country. Jordan is full of so many great things to explore...I cant wait to get there one day! 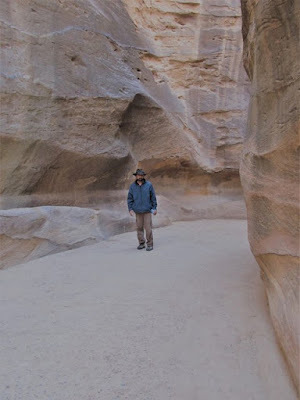 This is actually the first time that i have read about the fascinating walk down to Siq, before reaching Petra monument. Just seeing that one picture has filled me with so much curiosity already. I have already started imagining it all. If you haven't already seen 'Indiana Jones and the Last Crusade' check it out, Harrison Ford and Sean Connery are on horses going down the Siq and get that first glimpse of the Treasury building carved in the mountain. Petra is somewhere I have wanted to go for what feels like years! I've been a little hesitant to go due to conflict in the region recently, but I have seen posts recently from a few travels who said it's totally safe. Maybe it's time to book my flight! Tourist Areas in Jordan are very safe, don't miss Wadi Rum while you are there. Amman and Petra...those are the two things I would not want to miss in my lifetime! Thanks for the awesome pics! My favorite place in Jordan was Wadi Rum. Jordan looks so amazing! I have really been drawn to Jordan and the Middle East in general. I really need to get there! Sounds like there is plenty to keep you busy in Jordan! As with most people we would love to visit Petra, would be one more amazing thing ticked off the bucket list! I'm so close to Jordan but unfortunately, I cannot go there on this trip, perhaps in a few months! What Country close to Jordan are you at? Petra may be my biggest bucket list goal. I've been fascinated for years. Sleeping under the stars sounds truly amazing as well!